If you immediately walk toward the bakery department of the grocery store to check out the cakes and pastries, you might be a future pastry chef. If you think using premade pie dough is a cardinal sin, you might be a future pastry chef. If you would rather whip up cream puffs on your own than buy frozen, even though you’ve never done it before, you might be a future pastry chef. If your favorite television show is “Unique Sweets,” you might be a future pastry chef. This is definitely a sweet job. Pastry chefs conjure up mouthwatering gourmet desserts like exotic fruit tarts, decadent chocolates, elaborate cakes and other deliciously indulgent eats like donuts and pastries. From spun sugar nests to plates painted with complex sauces to chocolate sculptures, pastry chefs aren’t just superior craftsman at their job, they’re artists, too. 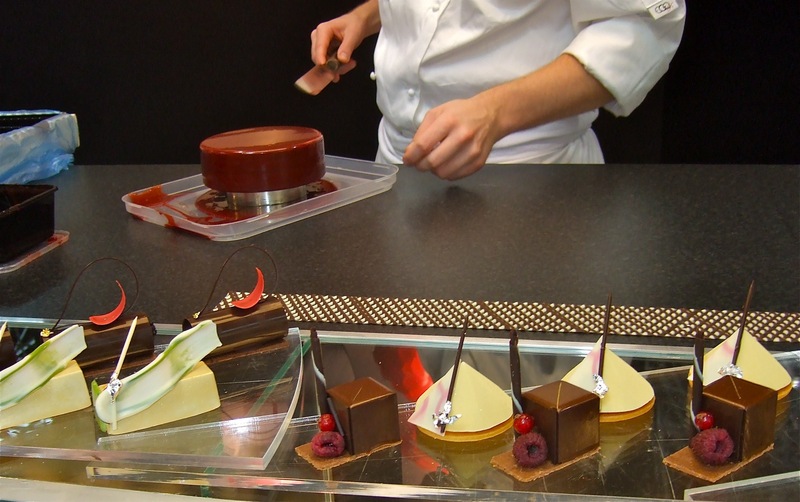 So what does it take to become a revered pastry chef? Must you apprentice under a master for years and years, abiding your time until you get a chance to showcase your artistic skills for a restaurant, bakery or hotel? Certainly you could follow this path if you come across such an opportunity, but then again, you could go to pastry school. First, you have to decide if you would rather bake breads or desserts. In the culinary world, there’s a distinctive difference: Bakers specialize in breads and rolls whereas pastry chefs focus on the sweeter side. If you know you enjoy baking homemade bread as much as you like being in charge of the family holiday sweets, then do a test run. Approach a local bakery owner, perhaps one where you’re a loyal customer, to see if you can shadow the bakers/chefs for a day. This way you get a firsthand look into what the job entails and can make an informed career decision. Next, research culinary schools, both local and regional. You’ll find there are a variety of options. Graduates of vocational programs typically earn a certificate of completion. Students are taught a basic overview of what an entry level position requires. In addition to learning recipes, you’ll get the industry standard information on safety and sanitation. A two-year program goes more in-depth into techniques and tools. You’ll receive more instruction on a wider array of baked goods and confectionaries. Depending on the school, students also may learn about savory cooking skills. Many of these educational programs operate like traditional college degrees but with a culinary twist. In addition to kitchen instruction, you’ll also attend classes on finance and business so you have a solid base of non-cooking operations. Generally speaking, the larger and longer the program, the more the tuition. Two-year schools could cost between $35,000 to $54,000. Costs for four-year schools mirror many university degrees, approximately $100,000 total. Inquire with admissions representatives about financial aid possibilities. These could include a mixture of grants, loans and work study. Several of the top institutions offer scholarships, including the James Beard Foundation, The French Pastry School, and the American Culinary Federation, among others. For a more complete list of potential scholarships, take a look at the Culinary School Guide. Americans have a sweet tooth that can be satisfied in many ways. If you’re not into chocolate, there’s caramel. If you don’t like cake, there’s fruit pie. If you can pass on cookies, there’s gourmet ice cream. Even the smallest community can support a pastry specialty shop or two, which will need to hire trained staff. However, there’s a heated competition for jobs. Perhaps the smartest approach to creating a pastry career is to combine both the old-school training with new-school education. When school shopping, ask if it places students in intern- or apprenticeships. If not, seek one out on your own. Although very often an unpaid position, an internship is an opportunity to apply your newly learned classroom skills in the real world. What’s more, you can learn from an experienced pastry chef under legitimate deadlines and workplace pressures. The best part is that the chef also has the chance to see how you work, which could eventually lead to a job offer. Next post: What are Diet Food Delivery Plans?